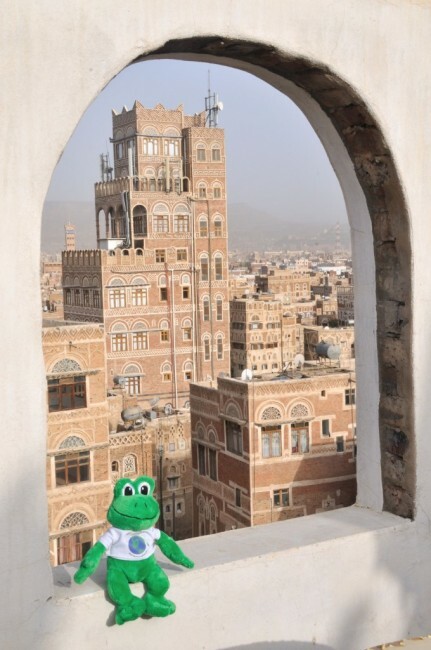 I was a very lucky frog to visit the amazing city of Old City of Sana’a in Yemen. My friend, Shane, said it was the most beautiful city he has ever seen. Early morning in the Old City of Sana'a, Yemen - this was the view from the roof of the hotel I slept in. The city was very different from anything I had visited. The main religion of Sana’a is Islam, so there were lots of mosques and during different times of the day one could hear the adhan or prayer calls coming from the mosque. Friday is the holiest day for the followers of Islam, so many things shut on that day. The market is called a souq/souk and there were a lot of little shops and nothing had prices marked on them, so people had to discuss the price that both the seller and buyer would agree – this is called haggling. There were many things to buy – clothes, souvenirs, brass object, food, spices and even donkeys! Shopping in the souq (market) of Old Sana'a - there were so many things to buy! There were not many tourists in Yemen, it was three days before I saw another one. All the local people were very friendly and kind, and they wanted to talk to me. There were many children that would work in their father’s shops after they finished school, so they did not have a lot of time to play. Kind and friendly people in Sana'a - everyone wanted to be my friend! Sana’a is a very old city – people have lived there for 2,500 years. It has always been an important trading city, and many caravanserais were established where traders could rest after their long journeys – they are like very cheap hotels. 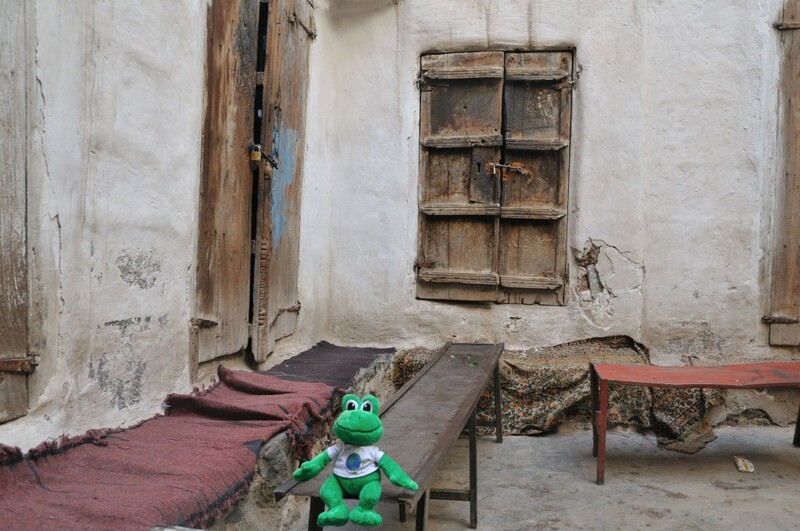 There are still caravanerais used in Old Sana’a today and I visited one that has been used for hundreds of years. It was like stepping back in time! The food was very tasty as well. For breakfast, we were served a flat bread, scrambled eggs, soft cheese and honey with yogurt. It was a great way to start the day! Falafels were popular as well and we would normally eat these for dinner. 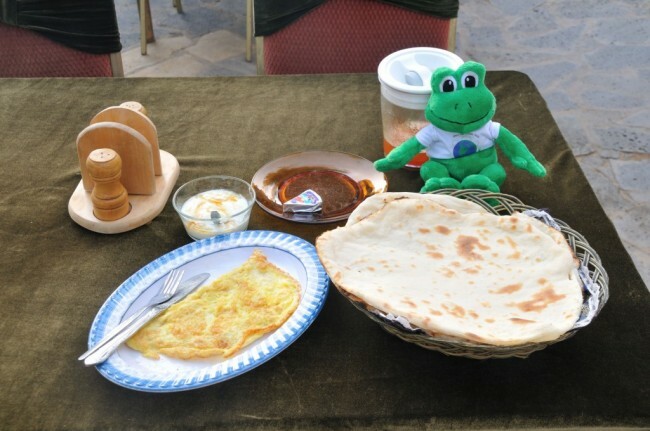 A Yemeni breakfast - delicious! One time we left Sana’a for a day trip to the Haraz Mountains. We had to get a security permit and pass through a checkpoint where there were many men with guns. I was a little scared, but Shane said that there was nothing to be worried about, so that made me feel better. Many of the villages were built at the base of cliffs, or on the top of sheer rock formations – it made the villages look very beautiful. One village called Kawkaban was very high on a cliff and the views from it were amazing. In Yemen, when people hope for something in the future they say Inshallah which means “If God wills it”. So I hope that one day I will to return to Sana’a, Inshallah! I love the pictures! The information is very interesting, and I think it’s amazing that you didn’t see a lot of other tourists. I really never thought much about taking a trip to this area of the world, but after seeing your post, I might put it on my wish list of places to visit! 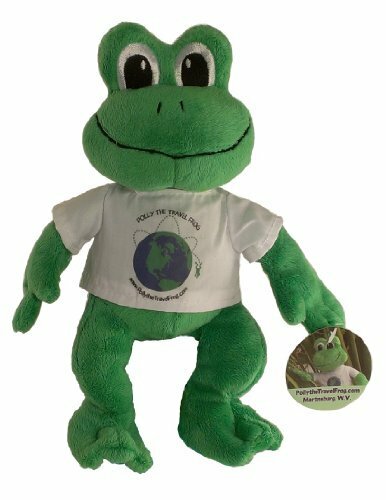 Thanks for such a fantastic post, Polly #7! Yemen is a place that many people will not be able to experience, and it’s wonderful that we have a window into this faraway place through your story and pictures! I am fascinated by the pictures, but really love the first one. I bet the view was magnificent on the rooftop, especially around sunrise and sunset. Three days before you saw another tourist! Wow! This is great! The first picture hooks the reader, and the rest of the post is spectacular. This looks like a place where travelers are more apt to go than tourists. I love learning about the world! Hi! I look at this site from time-to-time, and the food in some of the posts really intrigues me. I’m an American, and I admit that I love sugar, salt, fat, and everything that’s bad foe me. Anyway, I was checking out the breakfast, and it does look delicious in its simplicity. The honey, soft cheese, and yogurt concoction actually sounds really good–and healthy! Maybe I should try it instead of my usual bacon, fried eggs, and hotcakes with maple syrup. I can almost hear my arteries hardening just thinking about it! Great post! The second picture looks like the street on Harry Potter. 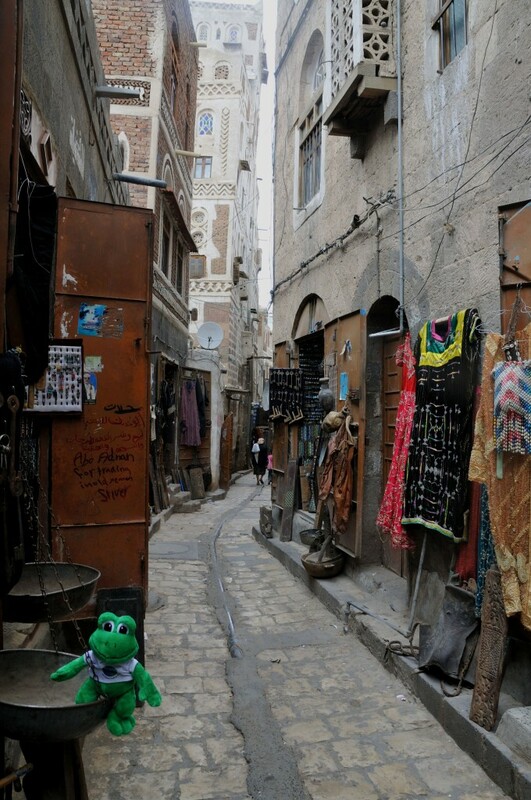 Congratulations Polly #7…this is the first post from Yemen!